"I make these oats at the beginning of the week and have them for breakfast through the week. 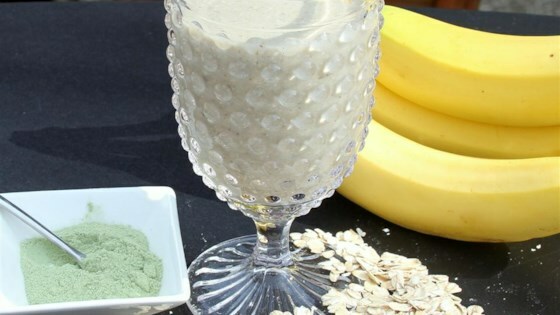 This method is so easy and convenient since its just throwing everything in the blender and then storing it in the fridge. I like to add superfoods to these oats to get the most nutrients first thing in the morning. I like to add chlorella powder, maca powder, and spirulina powder. You can also top your oats with more superfoods like goji berries, or these." Place apples and almond milk in a blender; blend until smooth. Add bananas and blend. Add almond butter, coconut sugar, maca powder, spirulina powder, and chlorella powder and blend until smooth. Add oats and blend until smooth. Substitute apple juice for the almond milk, if desired.